Our Wine Glass Writer Business of the Week, Alamo ACE Hardware (with two San Francisco East Bay locations, one in Alamo and one in Danville), has everything you need for your home, both inside and out. 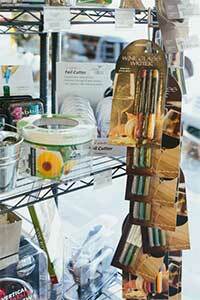 From garden supplies to house paint to appliances to home entertaining, this store has it all. One of the many things we love about Alamo ACE Hardware is that store management and employees are engaged with customers and tuned in to their needs. To that end, the full-service Alamo store has just expanded and now features 2400 square feet of space dedicated solely to kitchen items and cookware including kitchen utensils, cookbooks, candles, dishes, glasses, wine accessories and, of course, Wine Glass Writer! We've often wondered, and on a recent visit we learned, why the Alamo Hardware store sells so many Wine Glass Writers. The kitchen manager tells us many Alamo store customers purchase Wine Glass Writer for use in labeling canning jars (even more so than for writing on wine glasses!). Who knew? Alamo Hardware, is such a fun place to visit and the staff is incredibly helpful and kind. We absolutely love it there and could spend hours wandering the aisles of this wonderful store. We're sure you would, too! Beyond the wonderful in-store customer service, Alamo Hardware offers FaceTime and Skype services (via the store’s website) to answer customer questions and online how-to videos. How great is that? Visit Alamo Hardware’s helpful website to find out more about this beyond-the-call-of-duty store. If you're in the San Francisco Bay Area stop by for an in-store visit and let us know what you think!